The talent agency of actor Kim Bum has made public the behind the scene photos of the drama series he starred in, Padam Padam… The Sound of His and Her Heartbeats, on December 28th, 2011. 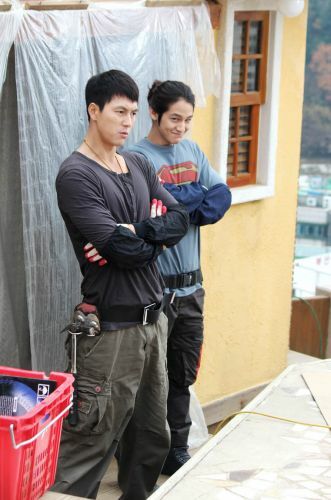 In the photo, Kim Bum suppressed an inclination to laugh and secretly imitated the actions of Jung Woo Sung at his side with funny expressions. During the rest time, Kim Beom had been waiting for Jung Woo Sung, he was perhaps the guardian angel for Jung Woo Sung both inside or outside of drama. Many fans and netizens who watched the photos said, “Kim Bum who imitated Jung Woo Sung is so cute,” “The angel Gook Soo who brings a lot of joy for everyone,” “Kim Bum who is no less handsome than Jung Woo Sung,” and so on. In the episode 8 of Padam Padam broadcast on December 27th, 2011, Gook Soo happily tells Hyo Suk (by Kim Min Young) that he has became a real angel, letting audience very curious on the follow-up story of Gook Soo.